Both technologies can provide high density vertical storage in a small footprint and improved inventory control while also supporting a product-to-person order fulfillment strategy. In a crowded and busy DC taking full advantage of all available floor space has always been a high priority. With the continued proliferation of medium and slower moving SKUs, finding storage and active picking slots for those products is driving operations managers to seriously consider any unused space within the facility. For DCs with a clear height of 20 ft. or more, the only space not being fully used is typically overhead. By taking advantage of unused overhead space the company might be able to eliminate the need for a building expansion, and may also benefit from improved order fulfillment system speed and accuracy. 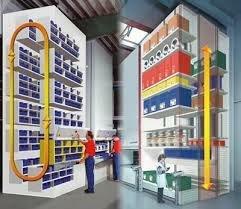 The adoption of vertical storage and retrieval technologies that can provide multiple benefits such as building cube optimization, improve inventory storage and accuracy, speed order fulfillment operations, and delay or eliminate the need for a building expansion and/or relocation project, are not only immediately beneficial to ongoing operations, but also have long term strategic planning benefits. Most logistics companies are, or soon will be, providing some level of e-fulfillment services. Adopting equipment and systems now that will also support that initiative is good planning strategy. Thanks you for the good article. What are yout thoughts on Vertical Buffer Modules in comparison to VLMs and Verticals?